Dizziness can often appear during the flu and is normally caused by dehydration. During this time, the body is often expending a great deal of energy trying to fight the virus, which can lead to a loss of hydration through sweating, and feelings of extreme exhaustion. 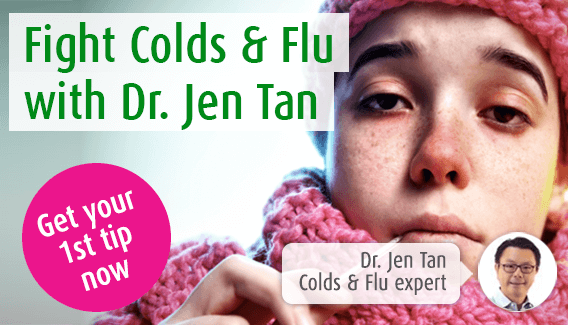 In this page, our immune system expert Dr. Jen Tan discusses why the flu can trigger feelings of light headedness, and how these feelings can be relieved using natural remedies. Dizziness is a feeling of light-headedness, lack of balance, or the feeling that the room is spinning. It can be very disconcerting, although is not usually the sign of anything serious. If your dizziness is connected with the flu, it is likely to be the result of dehydration, or a side-effect of a headache. Why am I experiencing dizziness with the flu? When you are run down by a virus, your body becomes weak. Energy is diverted to the immune system from other parts of the body in order to fight infection. Your nervous system can be affected in this way, leading to dizziness. Flu symptoms often mean that you do not feel like eating or drinking anything. However, this is usually the main cause of dizziness, particularly if you have become dehydrated. Dehydration is of greater concern if you are also suffering from diarrhoea. Additionally, headaches can occur with the flu because of dilating or contracting blood vessels. Disruption to blood flow in the head can cause such symptoms of dizziness. Again, dehydration will contribute to these feelings. The most important thing is to keep rested and hydrated. Although you may not feel like drinking, even small regular sips of water should prevent you from becoming dehydrated, in turn helping to ease your dizziness. Not over-exerting yourself is also important, as the flu can make you weak. If you try to do too much, you are likely to develop dizziness as your body does not have the energy to sustain muscle function as well as fight off infection. If you experience a bout of dizziness, it is best to sit or lie down. Aside from making sure you don’t lose your balance and fall, keeping your head down will also improve blood flow to your head. Additionally, try to avoid moving too quickly. Taking your time when lifting your head, sitting or standing up will help keep your blood pressure constant and your blood flow regulated, minimising spells of dizziness. If your dizziness is caused by the flu, then helping your immune system to fight off the virus will bring the most effective relief for your flu symptoms. While the flu can cause your immune system to become run down, the Echinacea plant is one of the most popular herbs in Europe for balancing the immune system. This will help you to recover from the flu more quickly. Fresh Echinacea extracts can be found in licensed herbal remedy Echinaforce® Echinacea tincture or tablets. This product can also be used as a preventative measure against colds and flu. Are there conventional medicines to help with dizziness? Unless your dizziness is caused by something other than the flu, a doctor is unlikely to suggest a medication to treat this symptom. However, if you have a particularly bad bout of flu, or are a vulnerable patient, a doctor may suggest an anti-viral medication, most commonly Oseltamivir or Zanamivir. As a preventative measure, your doctor may suggest the annual flu jab. This is offered free to vulnerable patients, including the pregnant, those aged over 65, and those with a serious long-term, medical condition.